Do you ever wish that your coffee machine could recognize you and dispense your favorite brew automatically? How about if your mailbox could alert you when that important bill payment gets picked up by the carrier? The Boston office hopes to make the things around us a bit more connected. It started with a few people getting together to discuss the “Internet of Things” — the idea that everyday physical objects can be interconnected and share information via the internet. 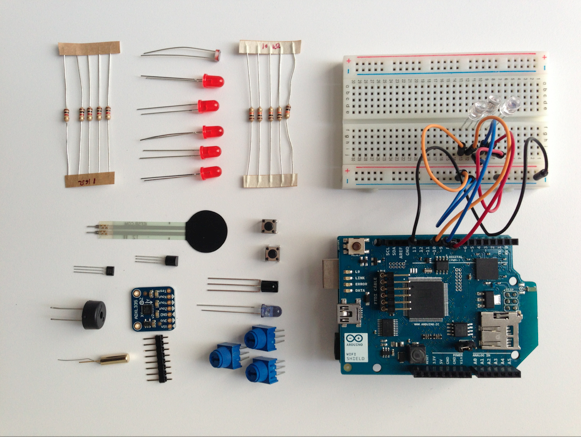 Soon, the group acquired some Arduino microcontrollers and set to work building small projects to familiarize themselves with the platform. Our first tasks: Blink an LED by clicking a button on a webpage. Measure the amount of sunlight in room. Play the Super Mario Bros theme song when someone presses a physical button. After a bit of practice figuring out what the hardware could do, the group set their sights on higher goals. If every object around us was connected to the internet, what could we do with that information? 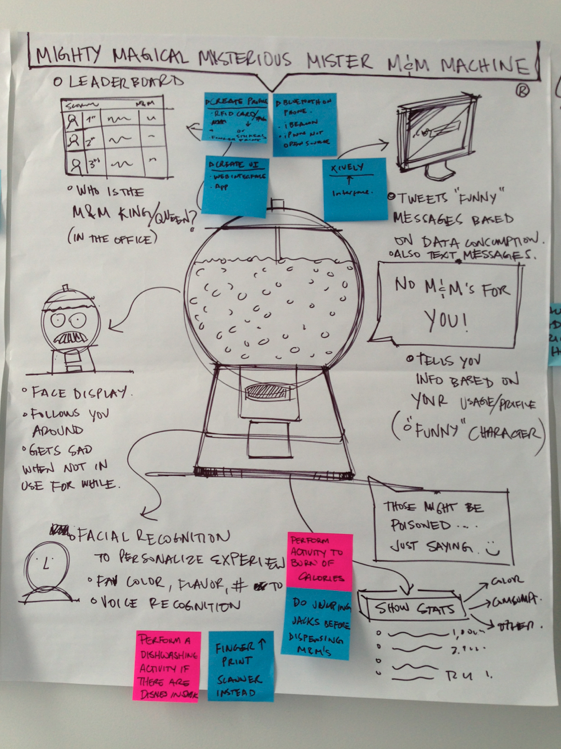 The team came up with dozens of ideas. Subway trains that would let you know you how many seats were empty; a sign at your desk that tells coworkers how focused you are (and whether they can interrupt you); an LED lightbulb that can say how much energy it has saved. 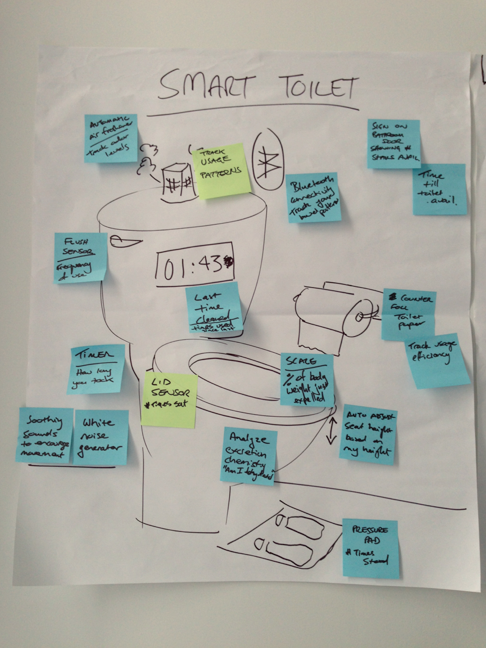 Eventually the group narrowed it down to two concepts to flesh out as case studies: a smart toilet, and a quantifiable candy dispenser. Imagine a toilet could help keep you healthy by displaying your weight, automatically cleaning and warming the seat, and even analyzing your contribution to the porcelain pot. And of course, it would remind you to wash your hands. Or a personable candy dispenser with a face and a mustache to give it a unique identity. He would tweet out stats about candy consumption including who ate the most and who ate the fastest. If he were connected to your fitness tracker, he could tell you how many more calories you need to burn before you get any more candy. If these things sound like they’d be fun to make, you’re right. Our goal is to take these projects from concept to reality. And from our tinkering, we began to showcase some of our thinking, receiving positive feedback and getting an initiative to have an Internet of Things working group in each our local offices -– complete with workshops stocked with the appropriate tools, learning resources, and hardware to build physical, interactive “things” for our clients. So boot up your microcontrollers, the race to build the neatest, quirkiest “thing” has begun.